I have always had a love for motorcycles. In the 7th grade my friends and I had subscriptions to Cycle World magazine. The hot bike then was the Honda CBX. Harleys were duds then. No respect. No reliability. AMF owned them and I was like... "They make volleyballs don't they?" The only people we knew that rode Harleys were guys that were kind of weird. I had a Honda 400 as my first bike. First thing I did was change it. Pipes, paint, accessories. I rode it in the rain, hot cold or whatever. I just rode. I traded it (literally swapped it) for a Kawasaki KZ750. All the KZ needed was the top end rebuilt and tires and cosmetics. I worked evenings in an independent motorcycle shop to earn the parts I needed. I worked on it for weeks. I took it home on the coldest night of the year. Man was that KZ fast! I moved from the KZ to a Harley FXRT, 1985 model. My life, as far as motorcycles was concerned would change forever. The low end torque and rumble wasn't like the other bikes I had been on. I fell in love with the sound, the feel and the whole experience. Immediately I adopted the attitude that so many HD riders have. They seem tough, but are bankers, lawyers, heck I was a computer geek. But I had it. I was on a Harley. In 1998, my wife and I purchased our first bike together. 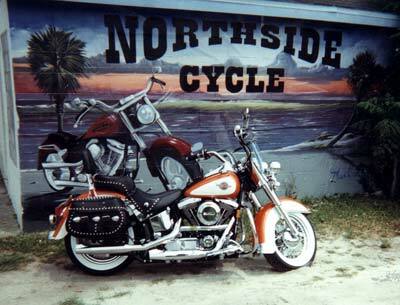 It was a 1998 HD Heritage Softail classic. It was the one in the window. We paid way too much, but it was ours. It changed our lifestyle completely. We were bikers now. Everything was about riding... what to wear, where to go and on and on. But this new bike brought an unforeseen new quest. The quest for comfort. As much as we loved riding that bike, it beat us to death. We bought a mustang seat, and a saddlegel seat and finally a Corbin seat. No matter what, we would always hit the wall at about 100 miles. Stiff, sore and tired. Our hearts wanted to ride but our backsides wouldn't let us. I sold that bike after 4 years and bought a 1999 Electra glide classic (used). Comfort was finally here! Not! It was worse. Cramped up, no leg room and our butts were hating us just as much. Maybe we were just wimps. I sold it after 1 year. Two years ago I purchased a Honda VTX1300. Had it to ride around town, we weren't under any delusions about comfort. Just had to have something to ride and it was cheap. That was January. We went to Daytona bike week in March that year. I heard that there were demo rides. Victory would let you ride and they had this bike called a Vision. Not Harley looking at all. Kind of futuristic. Not me at all, but I still thought it might be cool to ride one. We hopped on expecting to putt around in a circle when to my surprise the leader took off and left us in the smoke. "Oh no he didn't," I thought. I twisted that grip as hard as I could and my life would be changed forever. That bike roared with the rumble of 3 HD's and the torque was incredible. Every time I caught up with the leader he left me again. "This can't be legal," I thought. I hit the rev limiter in every gear as I finally caught him at 80. The feeling of exuberance on that ride was unforgettable. When we got off of the bike, both my wife and I felt like we just rode the wildest theme park ride ever. I had NEVER had an experience like that before. I had to have a Vision. Not a Vegas, Kingpin or another HD. A Victory Vision. But with the economic downturn and our existing bills, it wasn't gonna happen. Nearly 2 years later we went to the Fuel-it demo ride at my local dealer, and the next day put a deposit on a vision that they didn't even have yet. It came in 3 days later, a week earlier than expected, and now I have a pearl white Victory Vision in my garage. We are back to a lifestyle of bike-centric living. Finding reasons to ride and places to go. We have a new attitude, really one of pride in American ingenuity and ownership of the finest bike ever. But is the Vision the perfect bike? Could there be shortcomings? Sure. We all know that nothing is perfect. And the Vision is no exception. First of all. It's too quiet. With that 106 cubic inch powerplant, you would expect to hear what you feel, right? Sure there are those folks that are "stockers". No modification to their bikes and happy with the hint of a rumble the Vision comes with. Nothing wrong with that, but what about the rest of us? Every HD I've ever had came from the factory too quiet. But there are endless suppliers of aftermarket pipes in every style and configuration. Not so, for the vision. With something under 10000 units in total, there aren't a lot of options to improve the sound. There are Arlen Ness honkers at a cost of $500 or so. Polaris's own brand of Stage 1 level 2 at a cost of close to $1000 once it's installed. There's D&D and a couple of other custom options. I personally like the Thrush muffler install that falls around $100 bucks. (More info on this install can be found at vision-riders.com under Vision Technical). Another Imperfection that I've noticed are the stock exhaust heat shields. Rattles and buzzes galore. The rattling comes up through the fairing and seems to magnify the sound. I took it back to the dealer after about 200 miles to ensure everything was alright. The service manager isolated it to the shields. I thought I would tighten them up, but no can do. This year Victory went with straps that cannot be tightened. The only way I can think to stop the rattle would be to cut the straps off and replace them with adjustable pipe clamps. Probably about a 2 hour job. That is next on my list. The much talked about transmission is worthy of note here. It is definitely "clunky". Upshifting with RPMs up it is pretty smooth, but downshifting really amplifies the clunk effect. It's not a problem but it does take some getting used to. HD's have a similar effect but not to this degree. I wonder if it has something to do with the primary being gear to gear? A positive way to describe it is that it feels solid. When you shift you get a tactile feel that it is in the gear you put it in. The freedom engine definitely puts out some heat. I have noticed it on my legs at times, but I would not say that it is any worse than my Softail or Electraglide. 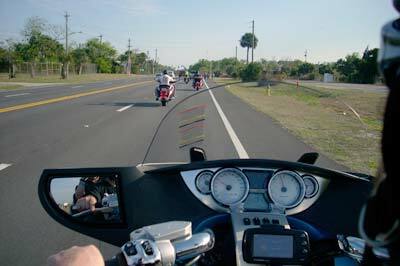 Heat is a part of riding an air-cooled motorcycle. My Honda VTX was water cooled so I didn't have any issues with heat while riding, but the Vision let's you know it's air-cooled. So with the new pipes, heat shields quieted, and dealing with limited sources for aftermarket parts where does the Vision fall in my list of bikes? It is without question the finest motorcycle I have ever ridden. The paint, detail and construction are tops. The performance, even at stock is beyond my ?98 Softail even after I installed the Crane performance cam. The torque is incredible and the riding experience is well... heart pounding excitement every time. My wife experiences the same thrill I do from the passenger seat. We want to ride and then ride some more. Where we used to stop frequently to rest, we just keep riding. Trips that were somewhat laborious on my Honda are effortless on the Vision. Everywhere I go people admire it, question it and fail to understand it. I know I am part of a small group of people who are Vision riders. We are the one's who get it. Vision riders exude confidence in their machines rather than throw rocks at others. 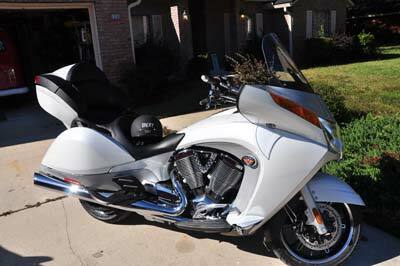 The Vision rider wants the V-twin power of a cruiser, the comfort of a touring bike and the performance of a sport bike. We want it all and the Vision delivers in a big way. The road to Victory has left us with complete satisfaction, and oh yeah... our butts are happy too. 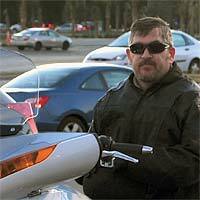 - Joel Chappell (chappellj) is a Communications Director and has been a motorcycle enthusiast for over 25 years. 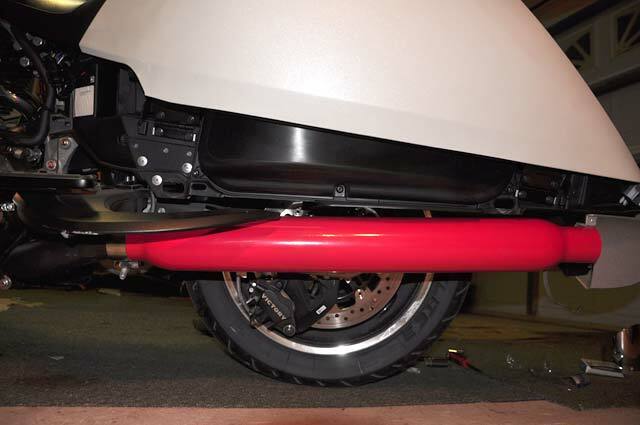 Editor's note: You can read more details on Joel's exhaust mod in this forum thread.